We pick up the action with him working on a clap track. He's using Native Instruments Transient Master plug-in. He says that with or without a compressor, a transient shaper can really lift your sound. Let's talk a little about how such an effect works. Most transient shapers are single-band processors, although there are some multiband ones. Technically, a transient shaper is a dynamics processor like a compressor, except that it's not affected by incoming signal level. In more practical terms, it allows you to independently accentuate or reduce the attack and sustain portions of a sound, which can be really handy. In the video, Fred wants to add a little attack, presumably to make the claps pop a bit more in the mix, and he removes a little sustain to tighten up the sound. He compares the claps with and without the processing, and you can definitely hear the attack being intensified by the plug-in. He also compares them in context of the drumbeat of the song. He says the clap track is "taking its space more, doing what it's supposed to do, which is attack." He recommends experimenting with the parameters on a transient shaper, to see how they're impacting a particular sound. To demonstrate some of the possibilities, Fred plays the track while turning the attack and then sustain up to extreme levels. To put attack and sustain in context, think of them in terms of a sound's amplitude envelope—which is a template for describing how the level of a sound behaves over time. We generally break that up into four portions: Attack, Decay, Sustain, Release (aka "ADSR"). The attack portion is the part at the beginning where the sound is reaching its highest level. A sound's transient is a short, high-energy spike in the attack, like when a drum stick first hits the drum head or the hammer on a piano first contacts the string. 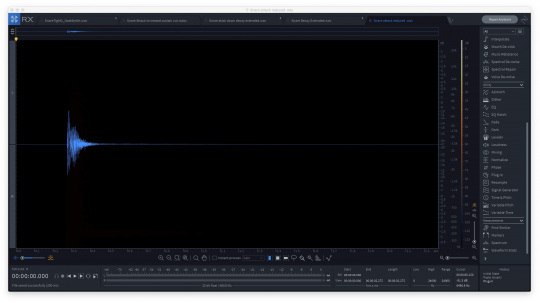 This screenshot of a snare waveform shows you the approximate position of the various ADSR elements. As the sound starts to drop in level after the attack, that's the beginning of the decay portion. Next is the sustain portion, where the sound remains at the same level for a relatively long period. 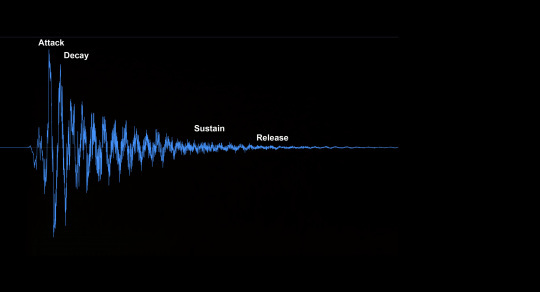 The release refers to when the sustain starts to drop in level and finally rings out or falls immediately to silence. A transient shaper works on the attack and the sustain portions of a sound. It allows you to make either more pronounced or less pronounced. Let's check out some examples. Example 1: An unprocessed snare sample. In the image below, you see its waveform. 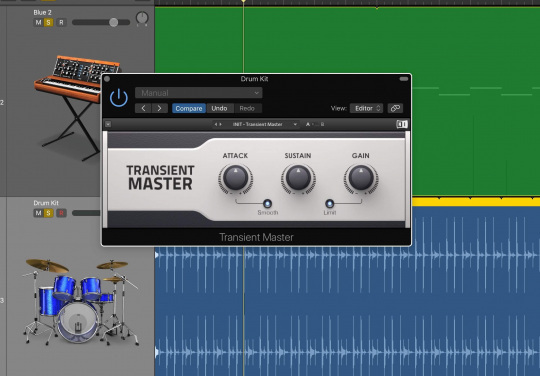 Example 2: The same snare with the sustain increased using Transient Master. Example 3: The snare from example 1, but with the attack level reduced with Transient Master. Those were somewhat extreme examples, but generally, you'd make your settings a little more subtle. So, if the drummer wasn't hitting with enough energy in the recording, you could accentuate the attack. Conversely, if you wanted the drum part more subtle, you could decrease the attack. Example 4: This two bar phrase plays once, then repeats. On the repeat, the Attack was increased by 16% and the Sustain cut by 71%. The result is a more staccato part. If you really want to get deep into transient shapers, consider a multiband version, such as the transient module in iZotope Neutron 2. A multiband transient shaper allows you to apply transient shaping in several different frequency ranges, allowing you the ability to target the processing even more tightly. With a multiband transient shaper you could say, increase the attack of the upper-midrange frequencies of a kick drum's transients without boosting the low part, thus bringing out the beater sound more. A transient shaper's ability to manipulate the amplitude envelope is reminiscent of the amplitude adjustments that you can make on a synthesizer. Most synths give you full ADSR control (sometimes even breaking the envelope into more than just those four parts), letting you do a lot more than you can with a transient shaper. Here's an example. Example 6: Here's an arpeggiated synth part, using Rob Papen's Blue 2 software synth, accompanied by a drum loop. All the changes in the synth sound are due to adjustments in the attack, decay and release time that are going on periodically through the example. It shows the power of an amplitude envelope.